One of the most effective returns you can hit in pickleball is the forehand slice because with a slice you can hit your return deep, give yourself time to get to the non volley zone line and keep the ball low making a 3rd shot drop much more difficult to hit. It’s very effective and when hit well it can keep the server back and prevent the serving team from establishing themselves at the net. In this video we do a step-by-step analysis of Ben Johns’s forehand slice return. Ben has one of the best slice returns in the game. 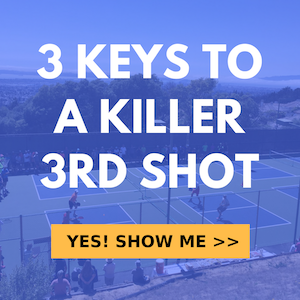 Watch the video to find out how you can improve your forehand slice return.